This report aims to support the work of Tearfund and other agencies by providing improved baseline knowledge through the identification of social connections and levels of trust among displaced and settled communities in Kurdistan Region of Iraq. It reports on research carried out by Tearfund and Queen Margaret University, supported by the University of Duhok and the American University of Kurdistan, in the Duhok Governorate, in Kurdistan Region of Iraq. The research aimed to test a methodology which has been developed in other locations to enable the identification of social connections and levels of trust in settings of conflict and displacement (Strang and Quinn, 2014). The methodology was carried out by local researchers trained by the Queen Margaret University team. Participatory activities used three different scenarios: immediate basic needs such as cash for food, clothing or other essential items; resolving disputes; and gender based violence. 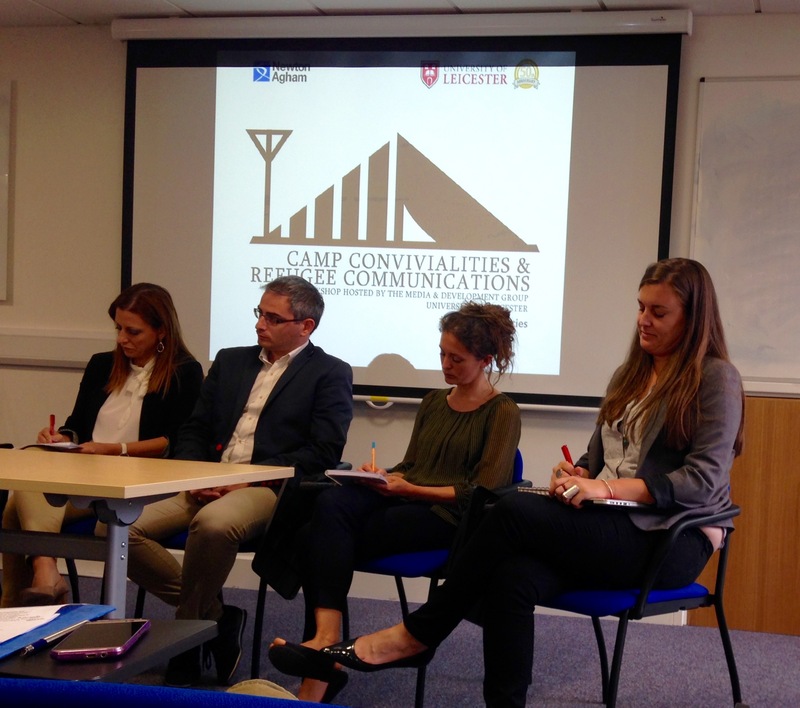 “Thinking about humanising a crisis”: this was the aim of a one-day workshop on ‘Camp Convivialities and Refugee Communications’ at University of Leicester on 13th July 2016. Participants were called to examine refugee camp life beyond the bad light commonly given them by the press, and to consider the experience of being in a camp. Participants were prompted to think about communications within and beyond the camp, and how media technologies might transform these. ‘Conviviality’ was a key term throughout the day, with speakers discussing how it represents real-time modes of interaction, which create new possibilities for communication. Dr Lawrence Ampofo from Semantica Research kicked off the day with by presenting his team’s multi-disciplinary research on mapping refugee journeys. Showing how digital infrastructure (including social media, apps and websites) is as crucial as traditionally important infrastructure (railroads or sea crossings), he explored communication practices around selfies, and the role of smartphones as both empowering and creating vulnerability. Workshop participants were particularly interested to discuss ‘The Map’ (see photo, left) that was shown. Trust was introduced as a core issue for refugee information-sharing, and was further explored by Nicki Bailey who presented BBC Media Action’s report into ‘Voices of Refugees’. She described the use of story-telling methodology as a platform for giving voice to Syrian, Afghani and Iraqi refugees who were travelling through Turkey and Greece. Through these stories, BBC Media Action highlighted some of the participating refugees’ priority information needs, as: the future – what next? ; rights in host countries; current status; and day-to-day practicalities. Victoria Jack then gave insights into Internews’s work to meet such information needs. Through their weekly publication ‘News That Moves’, Internews respond to rumours spreading across the Mediterranean refugee routes. Victoria underlined the importance of talking with, instead of about, refugees, while also highlighting humanitarian organisations’ fundamental challenge: they are banned from answering refugees’ prime questions – such as “Is it better to be smuggled to Italy or France?” This makes it difficult to engage trust. Socrates Moutidis concluded the morning with striking personal reflections on his experiences as a Greek journalist, negotiating the challenges and possibilities of reporting on large influxes of refugees into his community. try which shows the sewing together of hand-written stories, photographs and colourful sari fabrics. She reflected on how her Lightseekers project builds cross-cultural ‘convivialities’ within low-income communities, and acts as a way for immigrant generations to cope with inherited loss. Jonathan Corpus Ong from the University of Leicester presented his research on into ‘queer time’: how it is non-linear, and therefore pertinent in times of disaster such as the refugee crisis. He poignantly demonstrated the invisibility of the LGTQ community at these times, and pointed to a variety of ways that these sexual identities can be re-asserted through social media and performance, such as through Filipino beauty pageants, or the more tongue-in-cheek ‘Hot Migrants’ Instagram. Maria Rovisco used theorist Iris Young’s concept of the “wild public” as a lens to view the unruly conviviality that reins within spaces such as the Calais refugee camp popularly known as ‘The Jungle’. She contrasted the militarization of everyday life – the visibility of police, fences and violence – with programmes such as conversation clubs in the camp library, ‘Jungle Books’. Lucy Stackpoole, founder of Watipa, closed the panel with reflections on Participatory Action Research – a methodology that might be used more in work and research with refugees, to develop a more ‘convivial’, peer-to-peer model of co-facilitation. She posed a series of thought-provoking questions to practitioners in this field: “Whose realities count? Whose priorities count?”. Dr Myria Georgiou, of LSE’s Dept. of Media and Communications, gave the last session of the day. She presented ‘Communication Architectures of the Border’ as a complex nexus of humanitarianism and militarization, bringing the workshop to a question-fuelled ending.